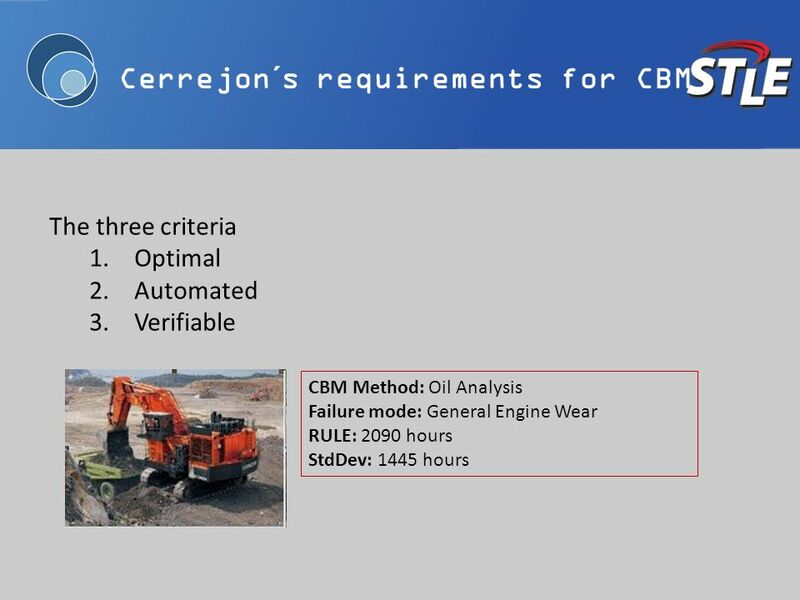 1 STLE 2012 CBM and Reliability Engineering Conference Achieving Reliability from Data at Cerrejón A Living Reliability Centered Maintenance (LRCM) project Gerardo Vargas, Carbones del Cerrejón Ltda. 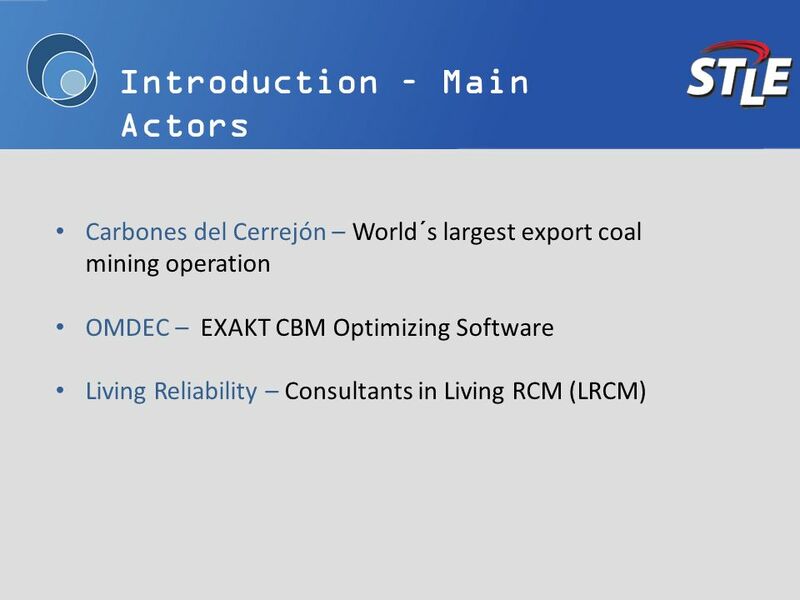 Juan Carlos Consuegra, Carbones del Cerrejón Ltda. 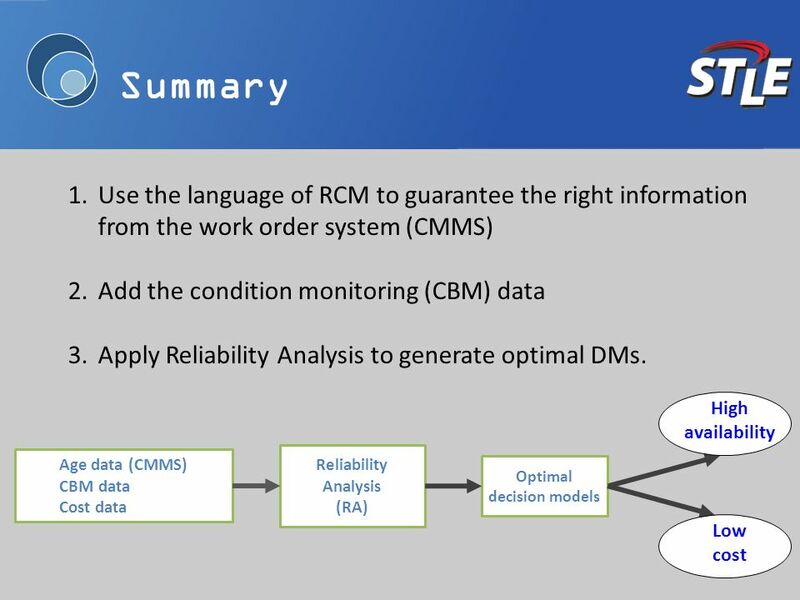 Oscar Hoyos Living Reliability (presenter) Murray Wiseman, OMDEC Inc. Dr. Daming Lin, OMDEC Inc.
4 RCM 1.What are the items functions to be conserved? 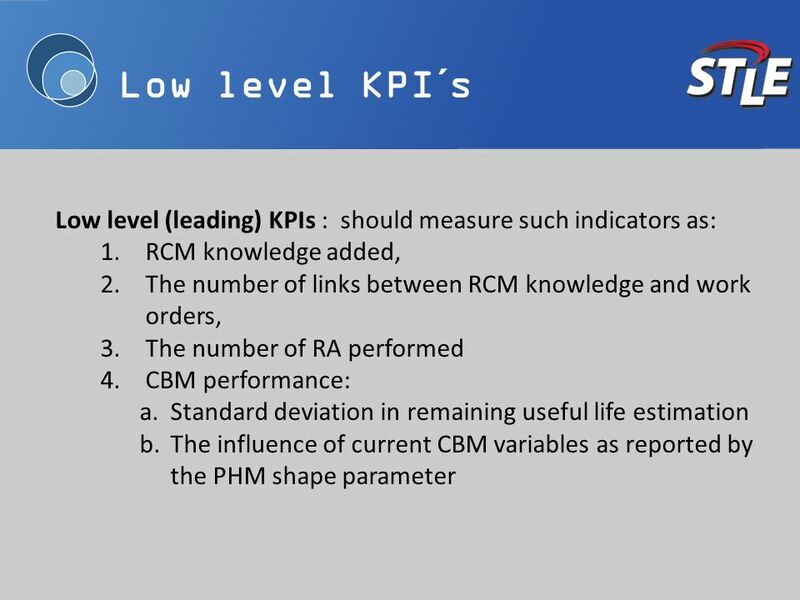 (The performance requirement)requirement 2.In what ways can these functions be compromised? 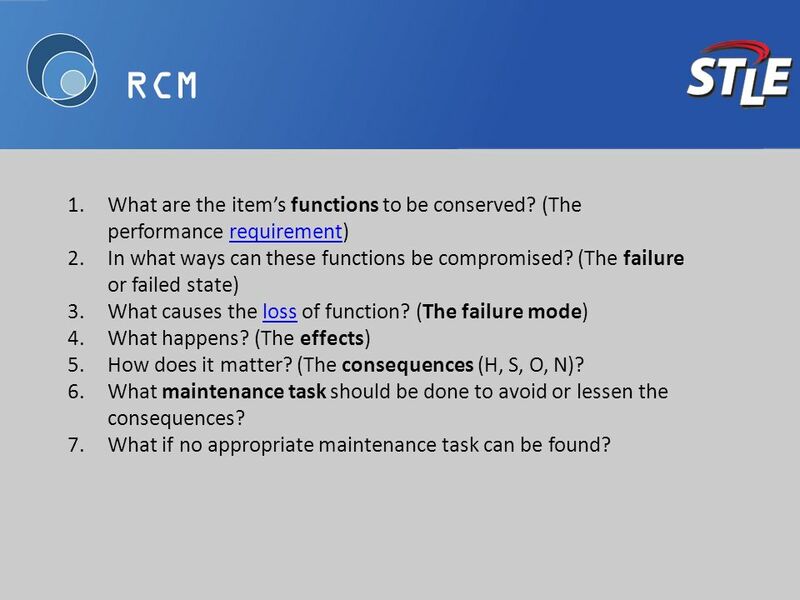 (The failure or failed state) 3.What causes the loss of function? 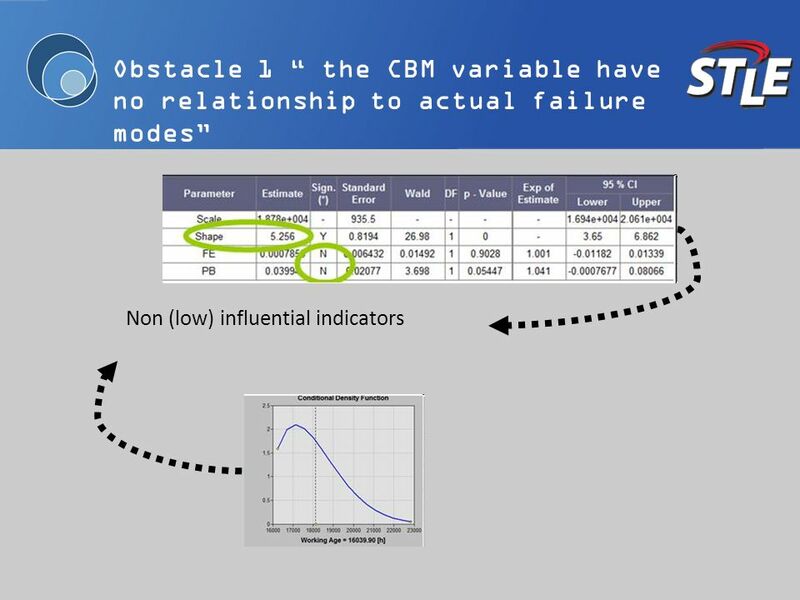 (The failure mode)loss 4.What happens? 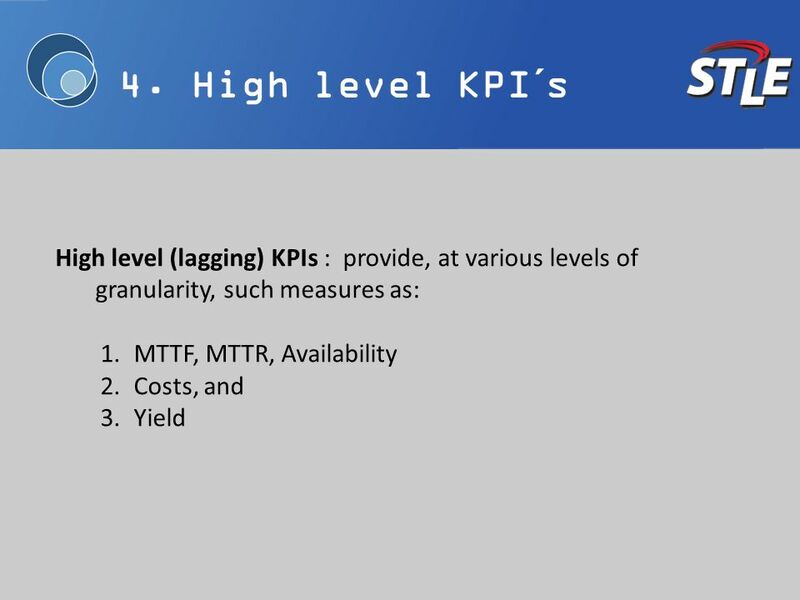 (The effects) 5.How does it matter? 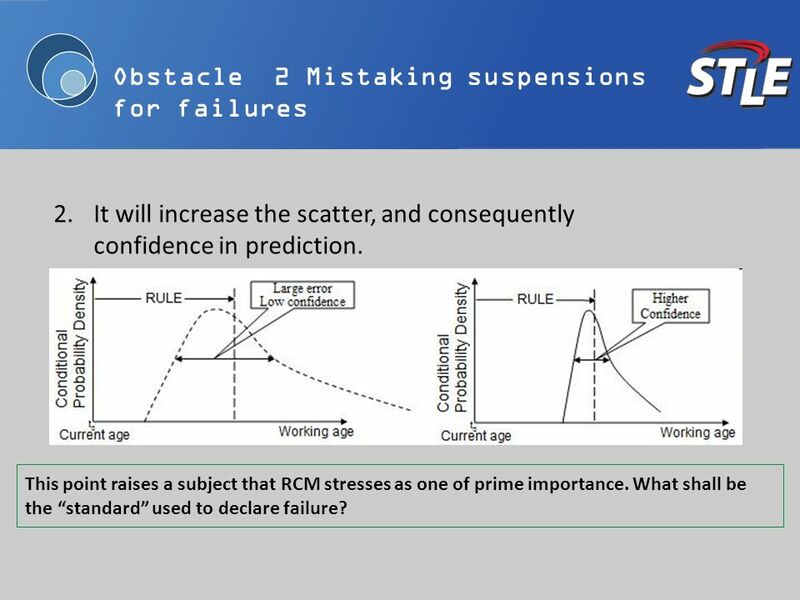 (The consequences (H, S, O, N)? 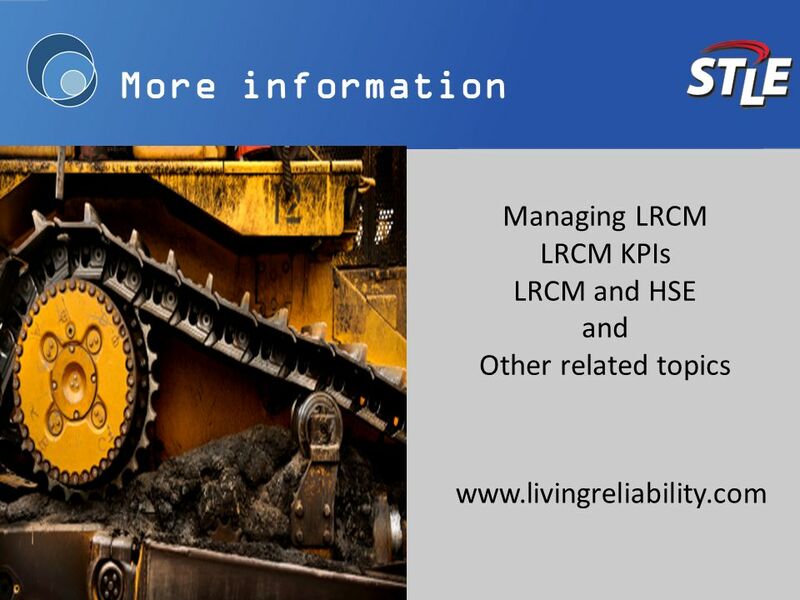 6.What maintenance task should be done to avoid or lessen the consequences? 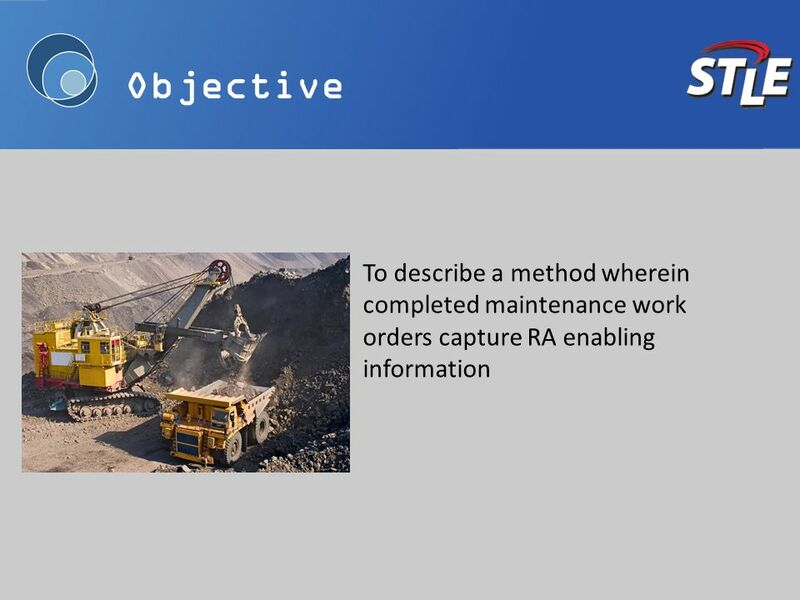 7.What if no appropriate maintenance task can be found? 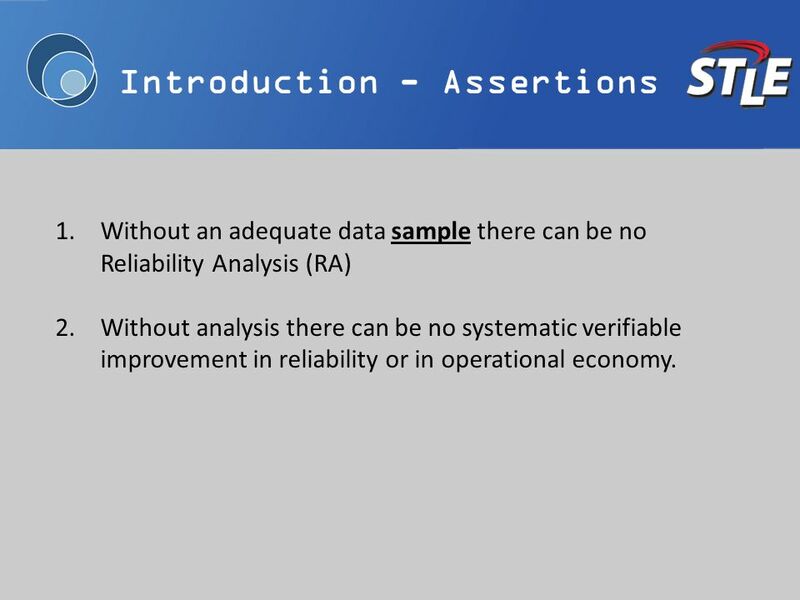 5 Introduction - Assertions 1.Without an adequate data sample there can be no Reliability Analysis (RA) 2.Without analysis there can be no systematic verifiable improvement in reliability or in operational economy. 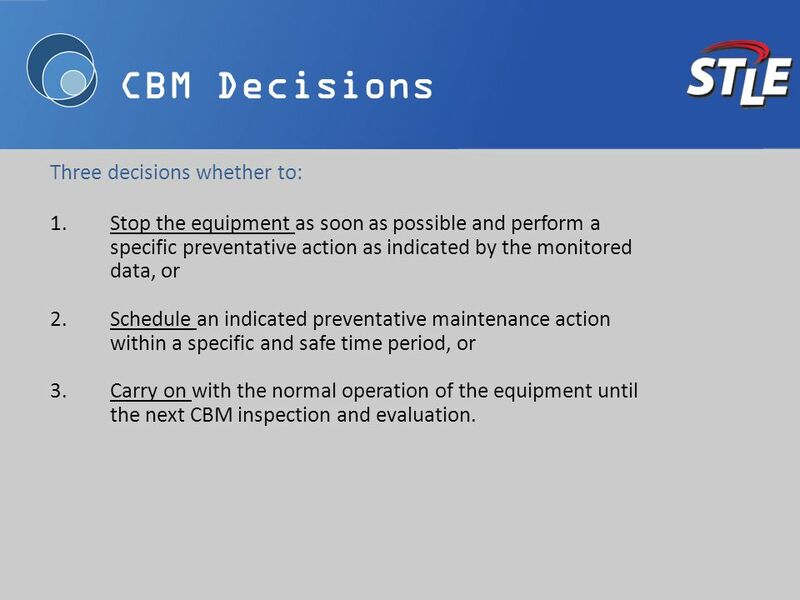 9 CBM Decisions Three decisions whether to: 1.Stop the equipment as soon as possible and perform a specific preventative action as indicated by the monitored data, or 2.Schedule an indicated preventative maintenance action within a specific and safe time period, or 3.Carry on with the normal operation of the equipment until the next CBM inspection and evaluation. 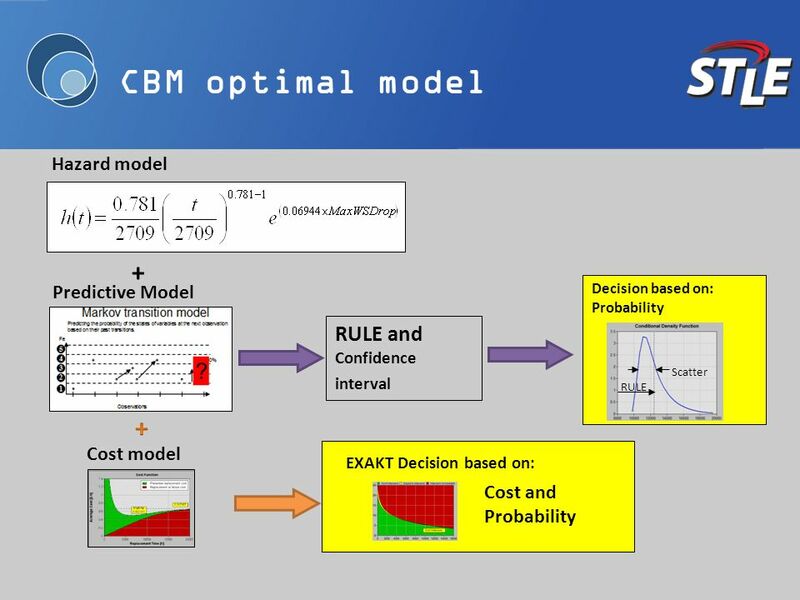 12 The obstacles There are two possible reasons for the unsatisfactory performance of CBM decision model. 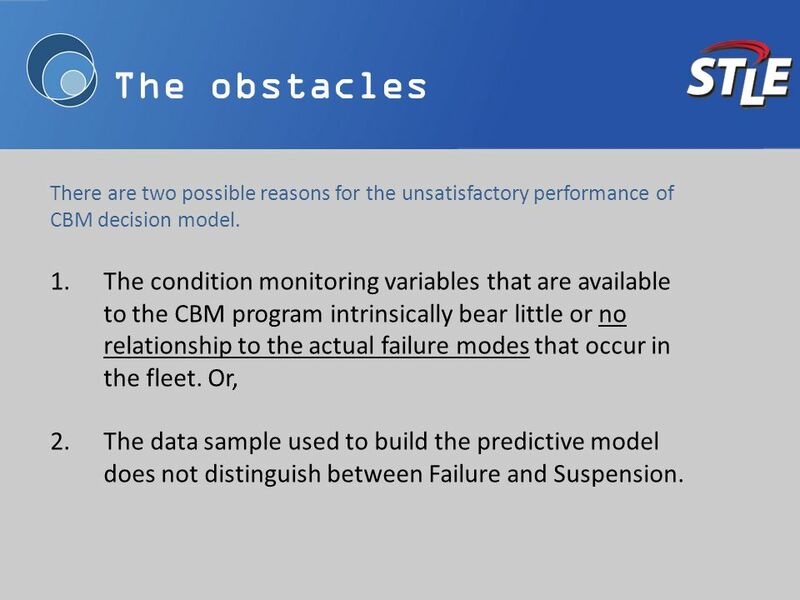 1.The condition monitoring variables that are available to the CBM program intrinsically bear little or no relationship to the actual failure modes that occur in the fleet. 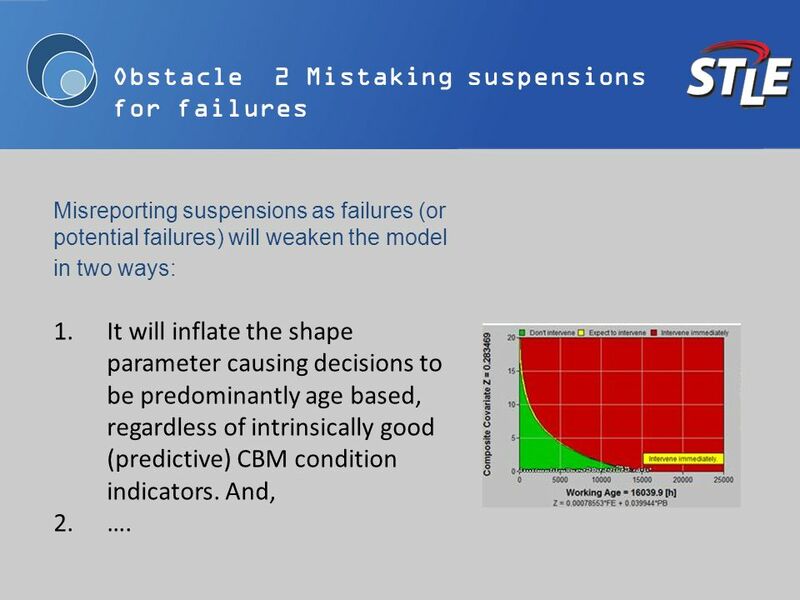 Or, 2.The data sample used to build the predictive model does not distinguish between Failure and Suspension. 22 4. 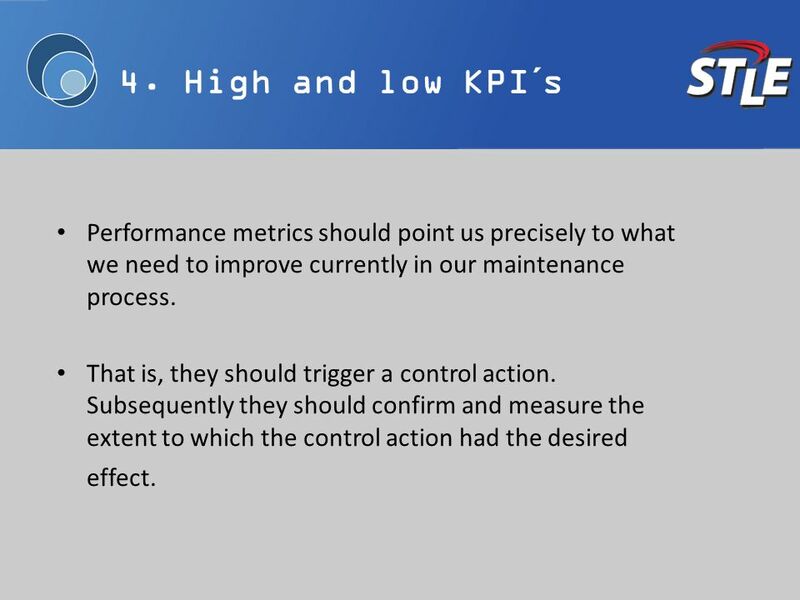 High and low KPI´s Performance metrics should point us precisely to what we need to improve currently in our maintenance process. That is, they should trigger a control action. 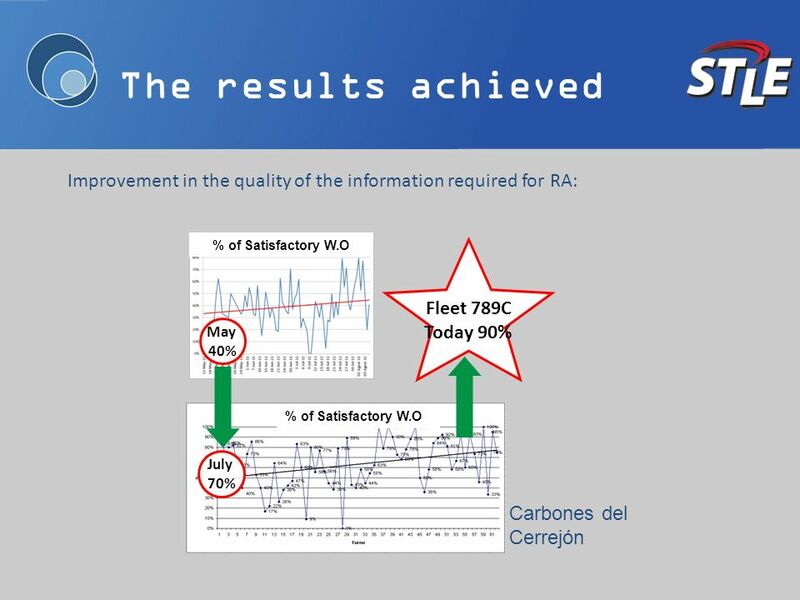 Subsequently they should confirm and measure the extent to which the control action had the desired effect. 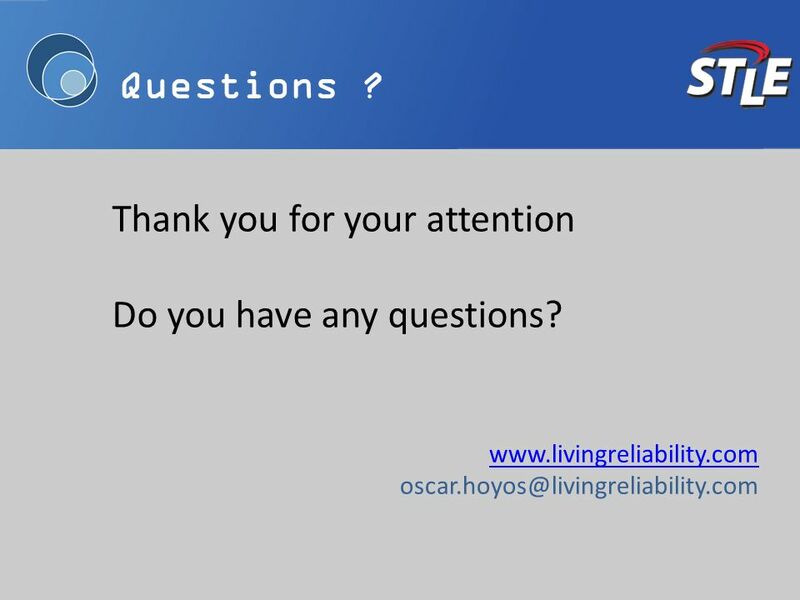 31 www.livingreliability.com oscar.hoyos@livingreliability.com Thank you for your attention Do you have any questions? Questions ? 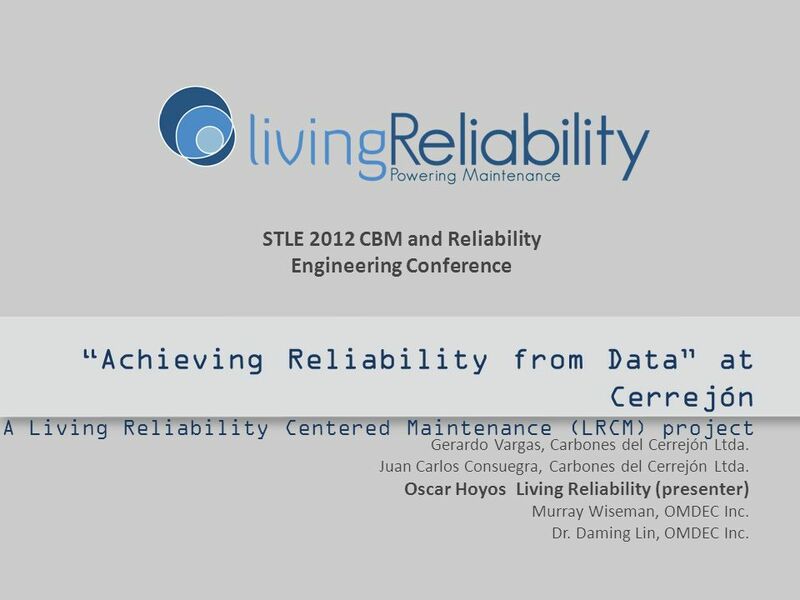 Download ppt "STLE 2012 CBM and Reliability Engineering Conference Achieving Reliability from Data at Cerrejón A Living Reliability Centered Maintenance (LRCM) project." 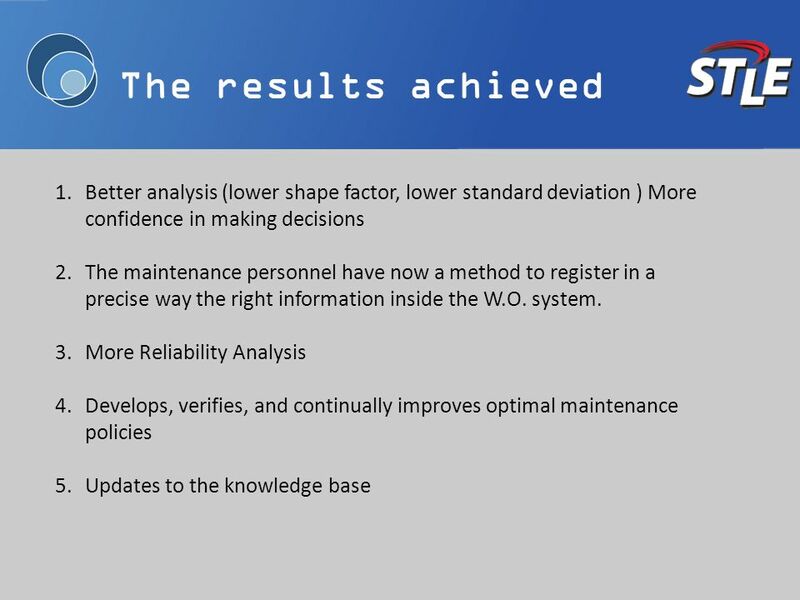 1 Impact of Decisions Made to Systems Engineering: Cost vs. 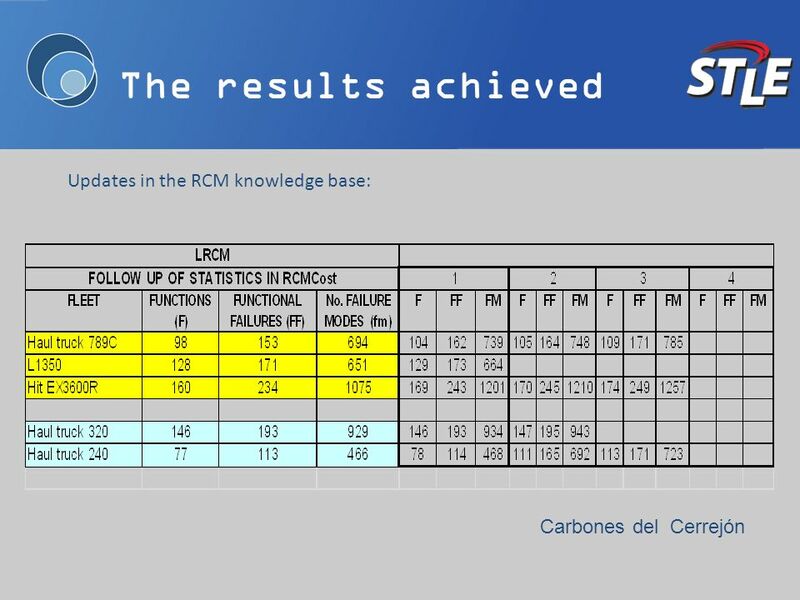 Reliability System David A. Ekker Stella B. Bondi and Resit Unal November 4-5, 2008 HRA INCOSE. 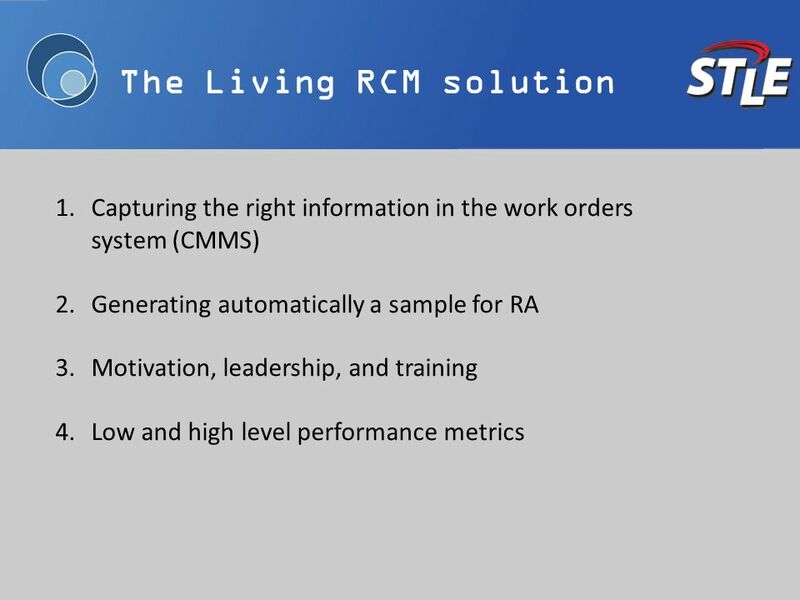 1 SMS – Spares Management Software Overview and Case Studies. 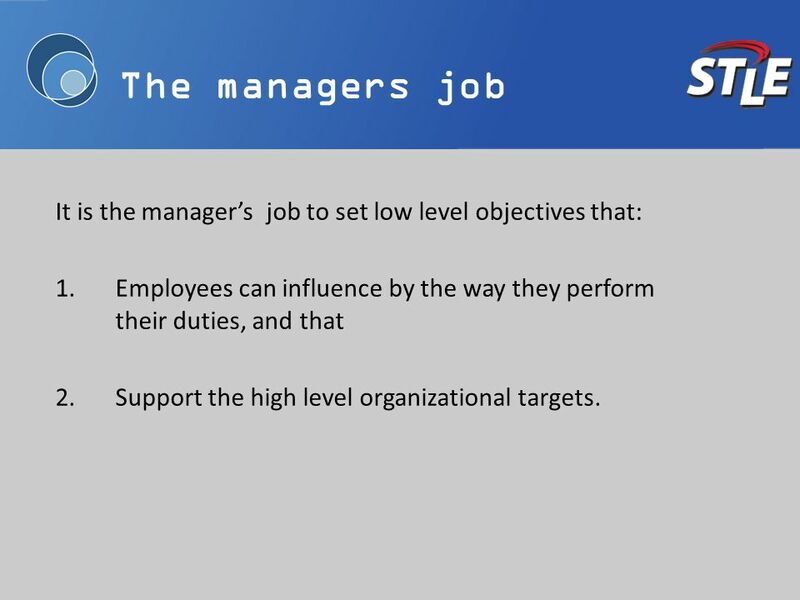 © AMD Publishing/ Terry Hill 2005 T. Hill, Operations Management 2e. 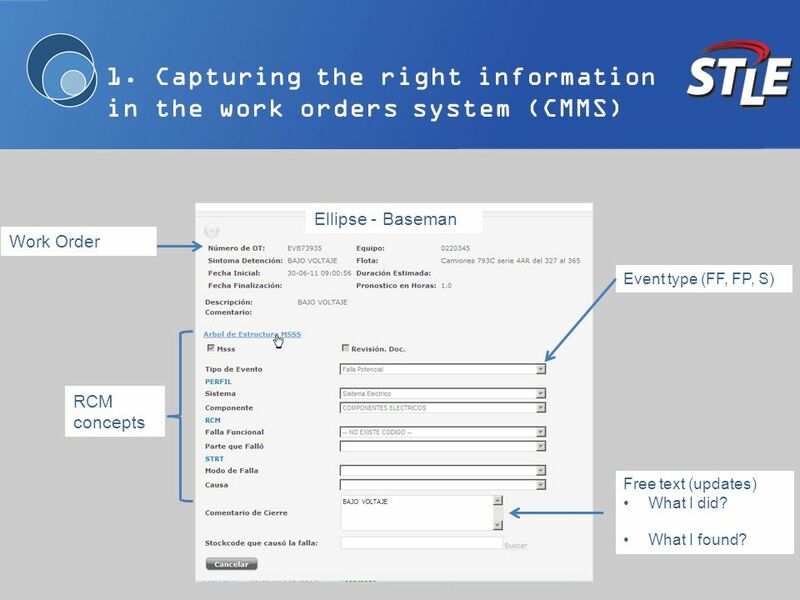 Palgrave Macmillan ISBN: / X Chapter 14 PROCESS AND DELIVERY SYSTEM. 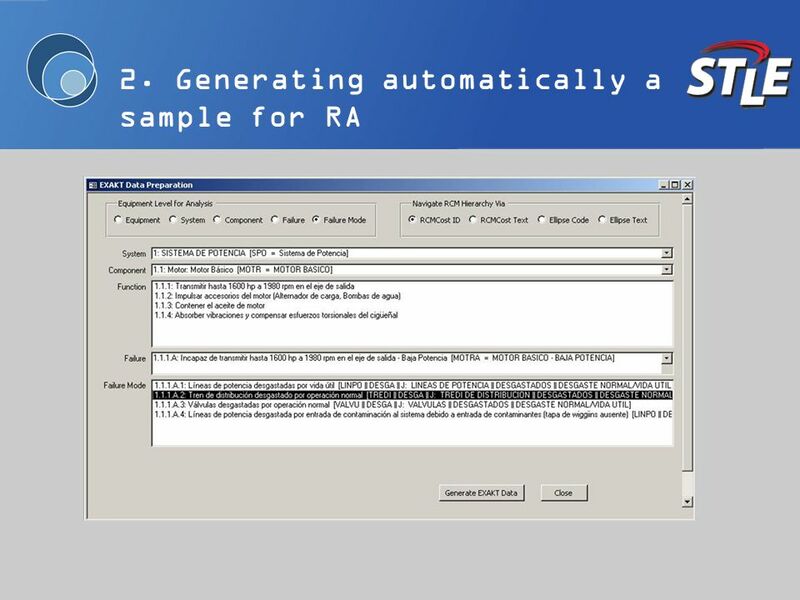 DATA CONSIDERATIONS Module 3 UNIT IV ADDITIONAL TOPICS " Copyright 2002, Information Spectrum, Inc. All Rights Reserved." 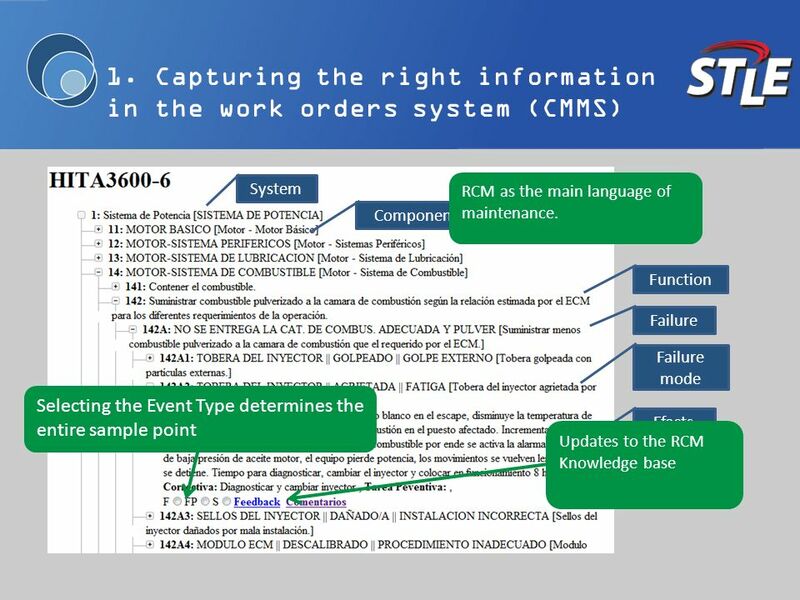 Questions on failure codes 1.Why do we collect information, generally? 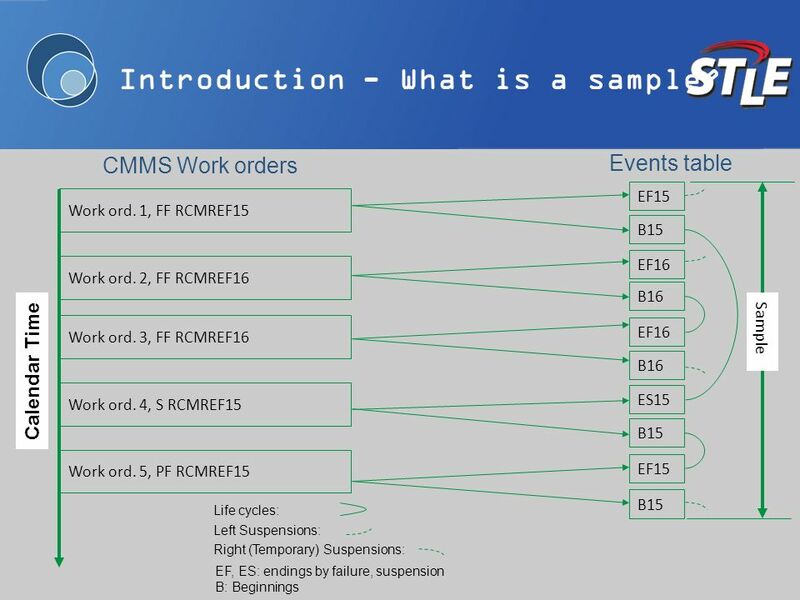 2.Why do we collect failure codes, specifically? 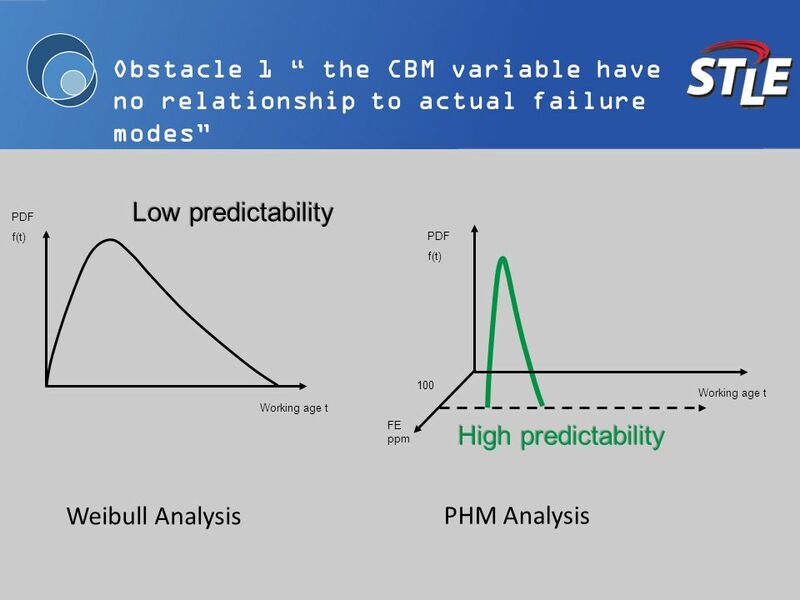 3.What is a failure code? 4.How. 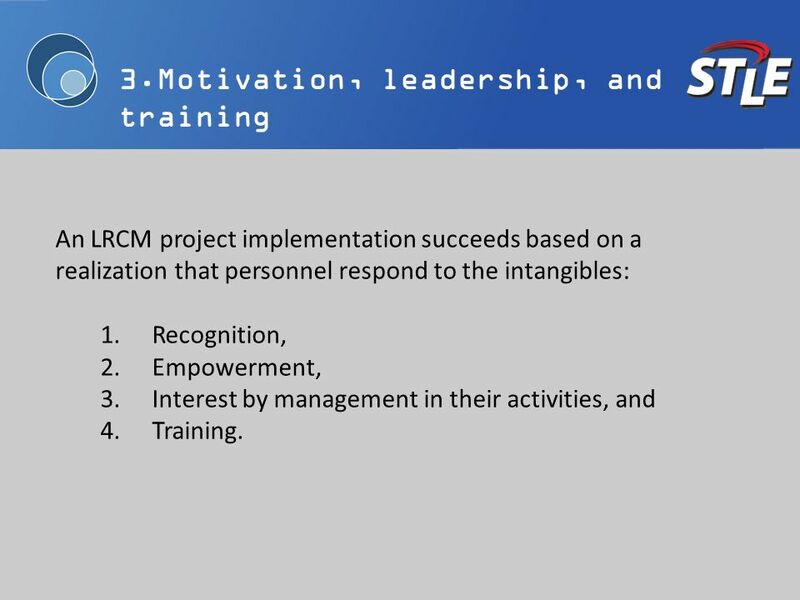 STEP 1 Develop/update RCM Program Plan STEP 2 New Equipment Design Recommended STEP 2B Complete Level 2 Breakdown STEP 4 Complete Levels 3 and 4 Breakdowns. 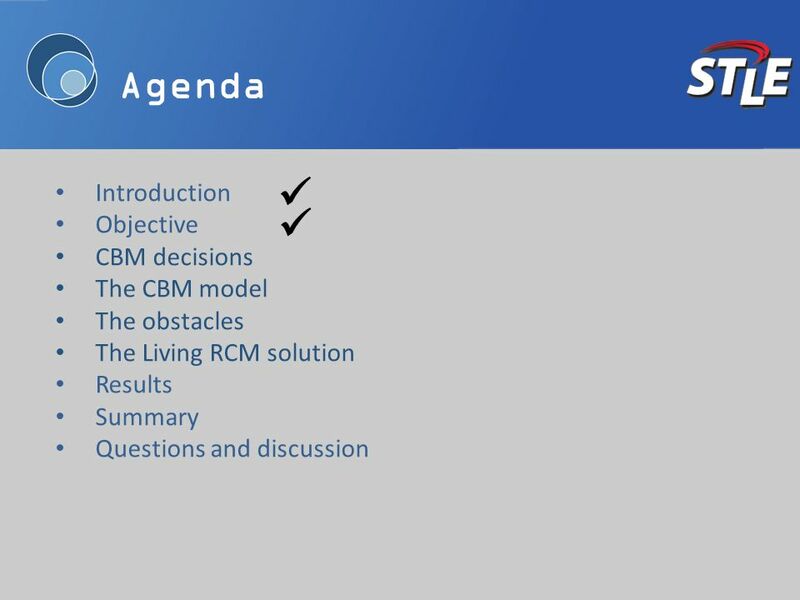 GoldSim 2006 User Conference Slide 1 Vancouver, B.C. 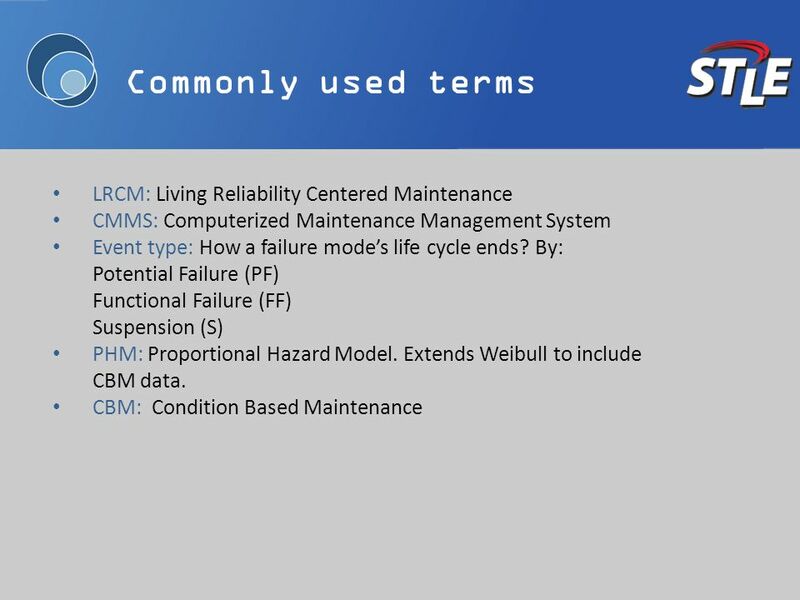 The Submodel Element.